As a mom, a working woman, I am always running around trying to achieve multiple things at the same time! But once a month, I make sure to make time from my special someone. After all, nothing would be the same without him! It can be a special dinner, a movie: a date night! When it comes to Valentine’s Day, I want this date night to be even more special. I organize it with extra care and imagination! I usually send the kids to their aunt’s house. I take care of my hair, my nails, and I make sure to prepare a nice romantic Valentine’s Day recipe! Since I want to spend more time pampering and getting ready for this date than cooking, I make sure to cook an easy meal! Contest Alert: Win a Spa Retreat for Two! ¼ cup of grated Parmesan cheese! Top with cheese! My husband prefers to put his cheese after so you will not notice any melted cheese on my recipe! Decorate with parsley and cherry tomatoes! Serve with your favorite salad. If you want to really add some romance to the meal, make our delicious Pomegranate Salad! 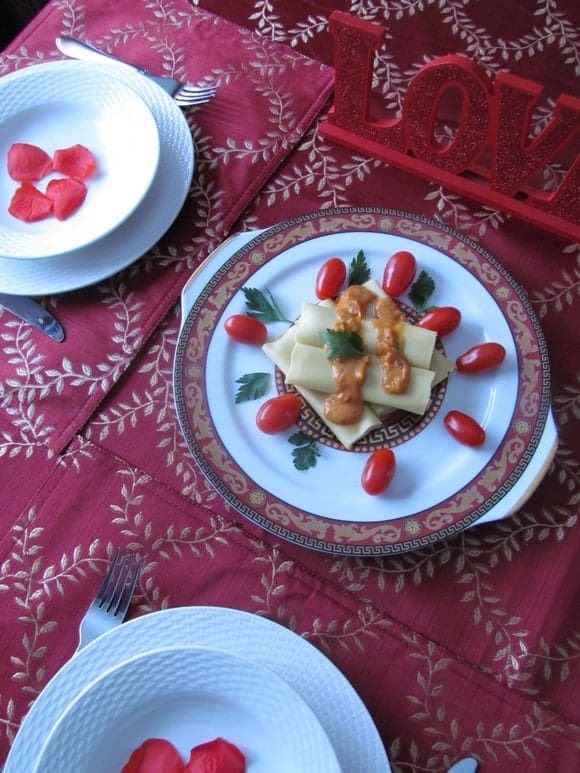 Part of this #Recipes4Romance Valentines Day dinner is the table set up! A delicious Valentine’s Day recipe can go a long way to making a night special, but I find that the extra details really show just how much you love someone. I chose a nice red tablecloth and matching place-mats to set the mood. Then I used simple white dishes to contrast with the red. Add some artificial flowers and the setting is just perfect. Now Valentine’s Day is few weeks away but my husband and I had an early Valentines Day celebration date! He loved the table set up and most of all: enjoyed every bit of the pasta! I was a bit nervous because he is used to homemade Italian pastat! He enjoyed every bit of the Manicotti with the rosé sauce! 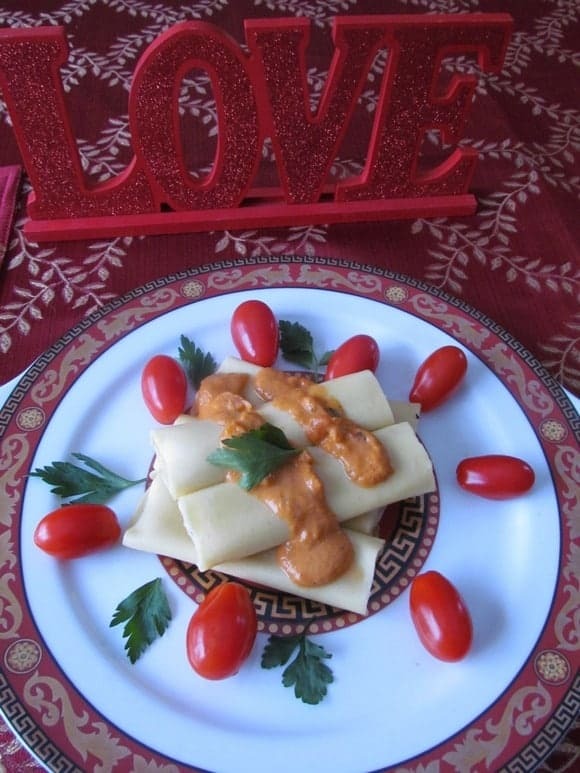 The four cheese inside the pasta melt in the mouth and the thick rosé sauce added such a flavor to them! He even dipped his favorite garlic bread into the pasta! He of course loved the manicotti! It was so delicious and the cheese just melted in our mouths! From now through February 23rd, head over to Win with Olivieri! You could win a spa retreat for you and your special someone! The contest is open to Canadian residents age of majority. Connect with Olivieri on Facebook and Twitter to keep up with all their latest news. Visit them on Pinterest to see other amazing recipes! Disclosure: This post is brought to you by Olivieri. All opinions are our own. My Dogs Go Bonkers for Purina® Beggin’ Strips®! Cute dish for valentines! My bf would go crazy for this! Your Manicotti looks delicious, a meal that we would really enjoy! Thanks so much for sharing with Full Plate Thursday and have a great weekend! Looks good! I like the added table decoration. Thanks for linking to the In and Out of the Kitchen Link Party. Hope to see you next week. I love the presentation of the pasta Olfa! 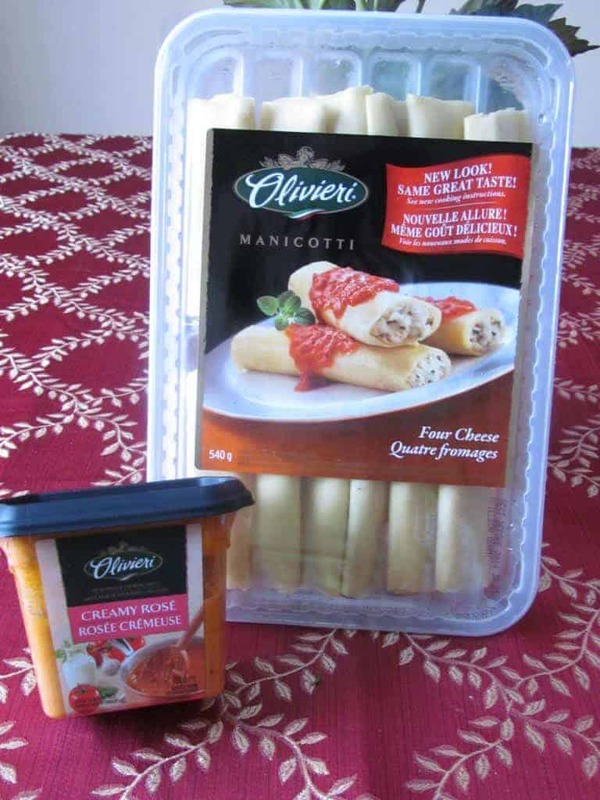 Manicotti is one of our favourites, but always takes a while to prepare. Love this short cut! Thanks for sharing at Simple Supper Tuesday. WOW1 Looks Delicious Thanks For Sharing!! Argh. We are moving valentine ‘s day weekend! So easy meals will be essential and we might celebrate fast, early this year. Anyways. This looks great Olfa!